Over 200 recipes based on the principle 'you are what you eat.' Low-sugar, low-fat, low-cholesterol recipes with a great emphasis on flavor, simplicity, and health. Cintia has covered the world of cakes—all of them free of eggs and cruelty. There’s a special something for every occasion and mood: 22 sponge cakes; 31 squares; 36 fruit loaves and tea breads; 30 gateaux and cheesecakes; 7 puddings; 11 small cakes; 7 savory cakes; 11 everyday icings; and 18 special icings and fillings. Delicious, elegant and imaginative egg free cakes for every occasion and mood. Recipes for birthday cakes, sponge cakes, fruit cakes, tea breads, icings, and fillings. The ideal book for vegetarians and people who are allergic to eggs. The concept of making cakes without eggs may sound difficult, but it is not new. What is new is the idea that so many delicious recipes could be put together in one volume. Cintia Stammers has spent several years collecting, testing and refining recipes worldwide. 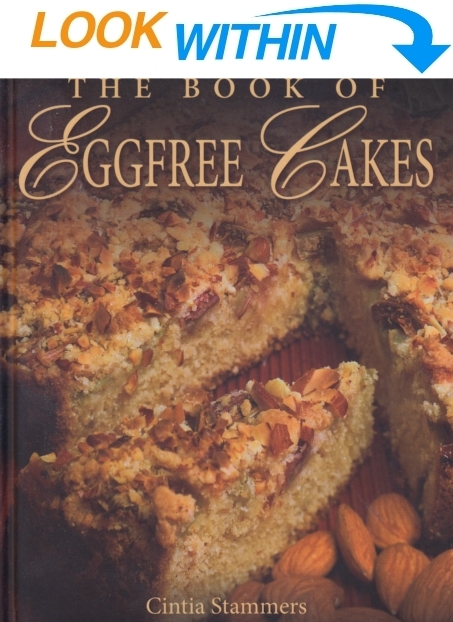 The resulting book contains more than 200 superb recipes that show how delicious, elegant and imaginative eggfree cakes can be. These recipes are based on the principles that "you are what you eat," leaning towards the low-sugar, low-fat, low cholesterol, with great emphasis on flavour, simplicity and health. For those who cannot eat eggs because of allergy or because they are truly vegetarian, this is the ideal book.